This is a beautiful “Half Puffin” from the “Kingdom” of Lundy. It was struck in 1929 by “King” Martin Coles Harman. It has been certified genuine and graded Mint State 63 Red by the prestigious Third Party Grading Service, Numismatic Guaranty Corporation (NGC). 23 Millimeter, Bronze. Original Mintage: 50,000. “Unusual World Coins” 5th Edition, by Colin R. Bruce II, published by Krause. X# TN1. Obverse: MARTIN COLES HARMAN • 1929 • King Martin. 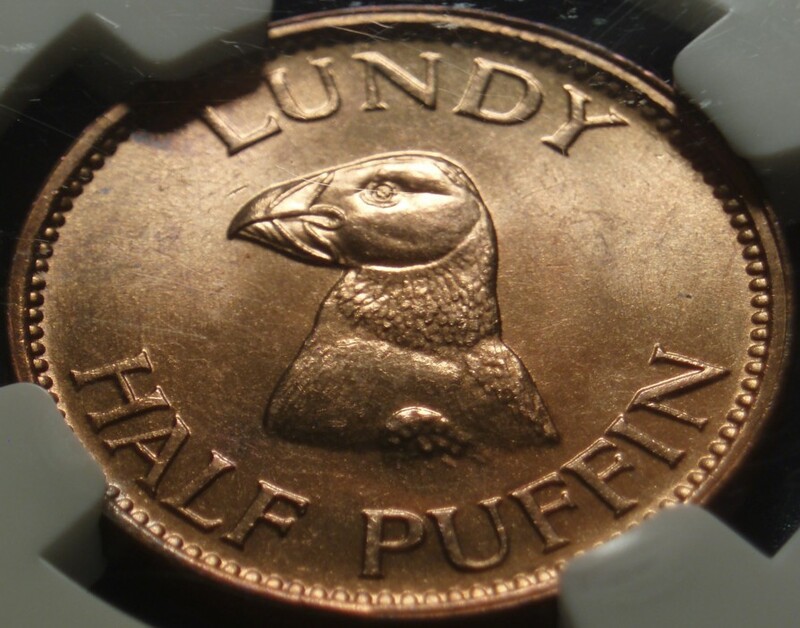 Reverse: LUNDY • HALF PUFFIN • The Puffin is endangered on Lundy today, but since 2005 is increasing. Martin Coles Harman bought the Island of Lundy in 1924. He declared himself King and in 1929 issued coins denominated One and One Half Puffin. The name Lundy comes from the old Norse name for “Puffin Island”. Supposedly worth the equivalent of a British Penny and Halfpenny, they got King Martin prosecuted under the coinage act of 1870. Found guilty by the House of Lords in 1931 he was fined £5. The coins were withdrawn and have become collector’s items. Martin Harman passed away in 1954. Today Lundy has been designated a “National Character Area” and is home to about 30 people. Note: Even though it has been professionally graded, grading is subjective, so please see the pictures and judge for yourself.